Small kids, small problems. My husband and I regularly reminded ourselves of this during the exhausting baby and toddler years. “There’s nothing they can do right now to permanently mess up their lives,” Jamie would joke. News flash: The teen years are no joke. Last month In December 2018, U.S. Surgeon General Jerome Adams issued an advisory about the the dangers of electronic cigarette use among U.S. teenagers. The surgeon general’s advisory called on parents and teachers to educate themselves about the variety of e-cigarettes and to talk with children about their dangers so I sat down with mine. I began our conversation with an open-ended question: Tell me about vaping? While traditional cigarettes have a negative stigma, vaping is seen as cool. My middle schooler shared that his peers are doing it everywhere–in the band room, bathrooms and even in the lunchroom and during class. Because the scent is not as potent as regular cigarettes, it is easier to hide, plus they are regularly talking about the great flavors. My high-school-aged daughter frequently has boys who instant-message her on Instagram with videos of them vaping…and teens are frequently posting Instagram stories and pictures of them in what looks like an “ethereal” cloud. “I think it’s pretty gross but some of their vaping pictures are really cool,” my daughter admitted. There is nothing cool about this statistic: Colorado youth are vaping nicotine at twice the national average and at the highest rate of 37 states surveyed, according to the U.S. Centers for Disease Control and Prevention. 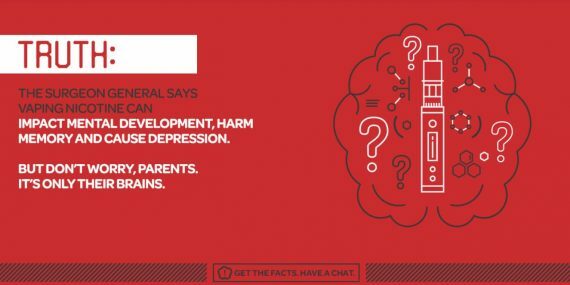 Here are some helpful tips for talking to your kids. Educate yourself before you have a chat. Nicotine has a negative effect on adolescent brain development, causing lasting cognitive and behavioral impairments, including effects on working memory and attention. Most teens start out thinking they can stop whenever they want and won’t ever become addicted. And lots more start smoking cigarettes, a product that kills half its users. 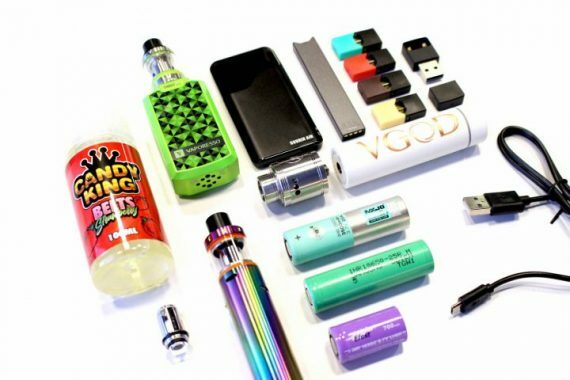 In fact, a teen who vapes is four times more likely to start smoking. About half of Colorado high school students have tried vaping nicotine. Only 7 percent of high school students currently smoke cigarettes, yet 27 percent said they vape nicotine. The statewide school survey shows 87 percent of Colorado high school students think cigarette smoking is risky, but only 50 percent think those risks apply to vaping nicotine. When you’re ready to talk, make sure you start by listening. Tobacco Free Colorado shares some helpful advice on how to make kids feel heard. The most important thing is that your child feels safe talking openly. Consider their opinions and keep the conversation going. Even if you’ve talked about this topic before, their thoughts can change. Plus, as youth get older, they can feel more pressure from friends and classmates. How can I tell if my child is vaping? That’s part of the problem – it can be very hard to tell if a teen is vaping. 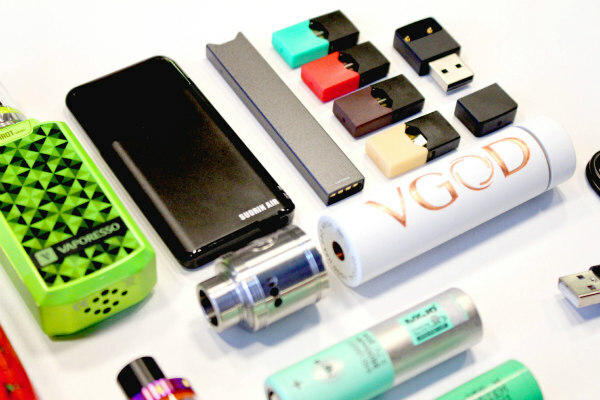 Not only do manufacturers make discreet devices that resemble flash drives, highlighters and more, but they also do not have the same strong odor like cigarettes that is often a giveaway for parents and teachers. Vaping is so discreet, in fact, that students have been known to vape during class. 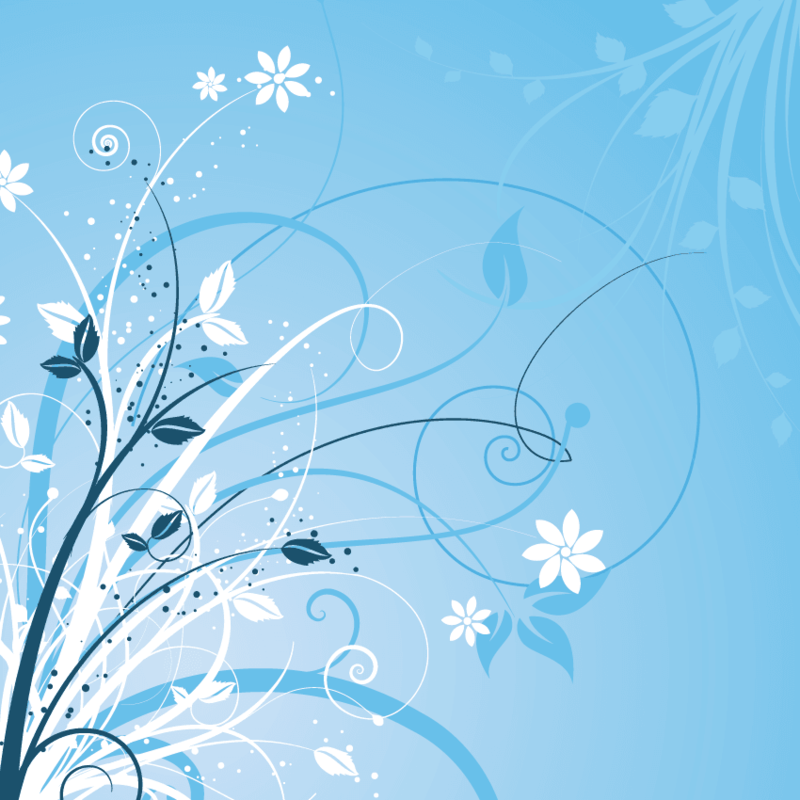 Read this fact sheet for helpful tips on how to really talk, listen and be patient. If you don’t think they’re vaping, now is the time to start the conversation (before there’s a problem). When you see someone vaping on TV, or if it comes up in conversation, or even if a friend or family member vapes, it can make starting the conversation easier. Ask them how they feel about it and let them guide your discussion. The first time my daughter saw vaping in public was when we were on a zipline tour and one of the 20-something participants would vape every time there was a wait. I took it as a learning opportunity as we later discussed about how his addiction level had to be pretty high if he couldn’t go a couple of hours in the gorgeous, clean air without vaping. Plus, it put a damper on our outdoor experience. Make family, school and sports team rules clear and stick to them. Let them know what will happen if they don’t follow them. Encourage them to make choices that help them achieve their goals. Teens that break school or school activity rules can be suspended or kicked off a team. Let them know that younger students and siblings look up to them as examples. How would they feel if a younger sibling got addicted to vaping? It is easier for youth to say “no” to peer pressure if they know not everyone is doing it. 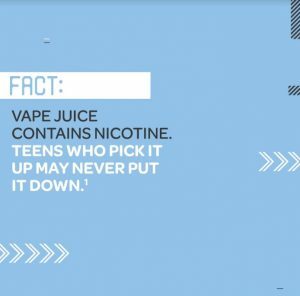 Let them know that more than half of high school and middle school students have never vaped, so they’re in good company. Here is my biggest takeaway from talking to my kids: Don’t assume they think vaping is bad. I was surprised by just how misinformed my kids were about the facts. But then I realized their main information source was their peers at school, and it instilled within me a sense of urgency to educate myself first, and then them. Their lives may depend upon it. This post is in partnership with Colorado Department of Health and Environment, but opinions are my own.